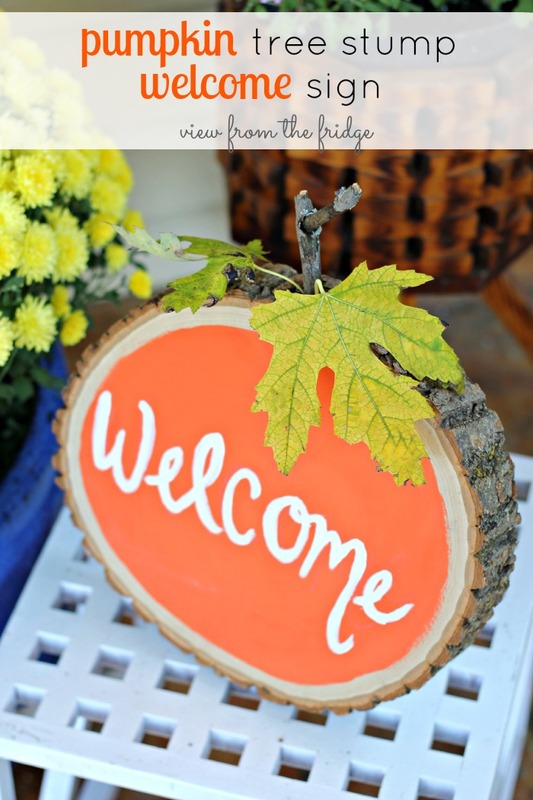 Autumn is here, and it’s time for fun DIY fall crafts! For many people, there’s no more lovely time of year than autumn. From the joy of carving Jack-o-Lanterns to the simple pleasure of raking leaves, fall is a time when life’s simple pleasures resonate. When summer fades into memory, that’s when the excitement of fall really begins. In honor of fall, we’ve got 28 DIY fall decorations that are truly fun to create. The heady first days of fall are ones of great expectation, as thoughts turn to the fun of Halloween and the comfort of Thanksgiving. DIY fall craft ideas celebrate this time of sharing good times with loved ones. The fall is such an inspiring time for getting warm and cozy, decorating just seems to come with it. In honor of this special time of year, we’ve got 28 DIY craft ideas for Fall to use for your own home. Here’s hoping you’ll find plenty of inspiration in these delightful decorations. This adorable pumpkin sign is made on a slice of a tree stump. Painting this sign is as simple as putting an orange oval on the tree stump slice and adding a hand-painted message. This sign would be charming on the patio, on the wall, or hanging over the Halloween jack-o-lanterns. 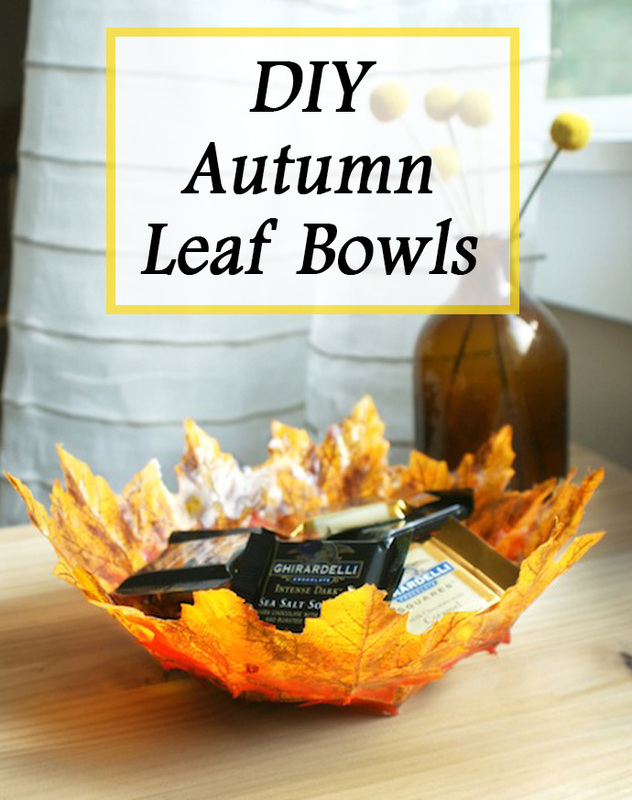 Make your own DIY autumn leaf bowls with these simple directions. Use silk leaves from the craft store. Blow up a balloon to the size you want to make your bowl. Paint mod podge onto your balloon and stick the leaves on. When the mod podge is dry, pop the balloon and remove it. 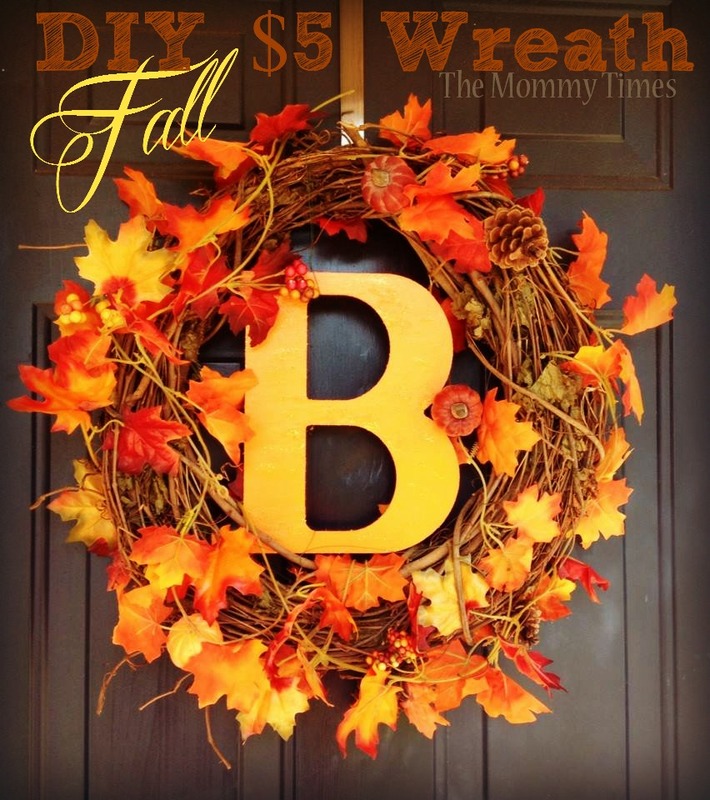 Use a foam base to make this rustic fall wreath. Wrap it with wide burlap ribbon. Then add yarn garland to the wreath. Make a beige burlap and artificial flower arrangement and place it on the wreath in place of a bow. Put some sticks in the floral arrangement for a natural touch. 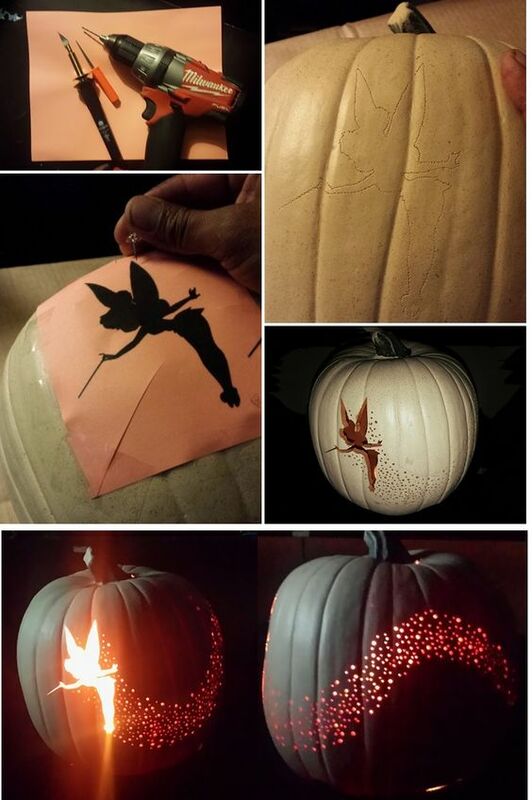 When a simple hand-carved pumpkin just isn’t enough, you can make a more intricate design like Tinkerbell using a stencil and a hot knife. For the fairy dust, use a cordless drill to cut tiny holes. Paint the pumpkin white before decorating. You can also do this on an artificial pumpkin to make a design you can keep for another year. This wreath is inexpensive and quick to put together. All you need are a grapevine wreath base, a bright and cheerful autumn leaf garland, and an oversized wooden letter for the center. Paint your letter gold for a shining touch that reflects the amazing colors of autumn. A cutout wooden sign showcases your woodworking ability. 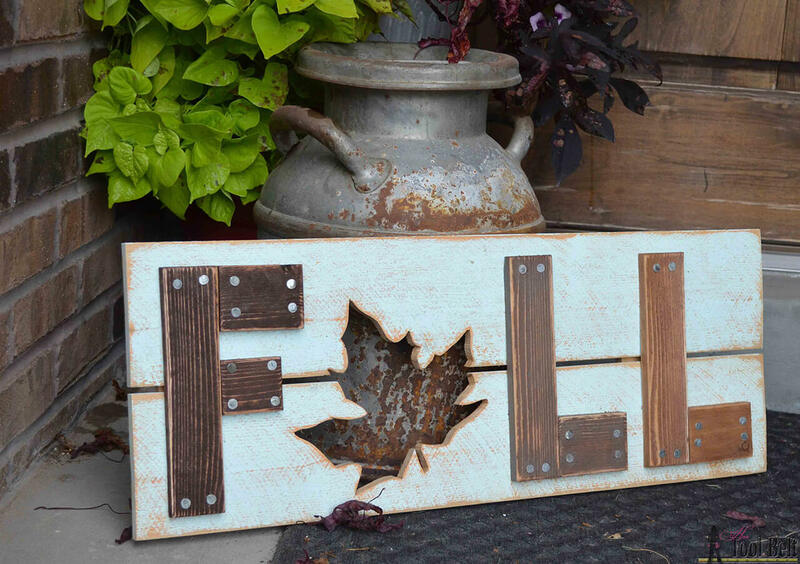 With a little skill with a jigsaw or a scroll saw, you can cut out the maple leaf on this sign. Stain the letters in different colors for a rustic look. You can use reclaimed wood, or paint your wood to make it look weathered. Make these cute pumpkins with wooden boards and ribbon bows. These pumpkins are so easy to make, even woodworkers with beginner-level skills will be able to put them together quickly. After you assemble the pumpkins, give them a cheerful coat of orange paint and a fun green burlap bow. These maple leaf lanterns are made with silk leaves or real leaves and Mason jars. Silk leaves will last longer. Using mod podge, glue the leaves inside the jar in a single layer. Overlap them a little bit for a natural appearance. Add a raffia bow. You can use battery operated tea lights inside the jars to provide a warm glow. 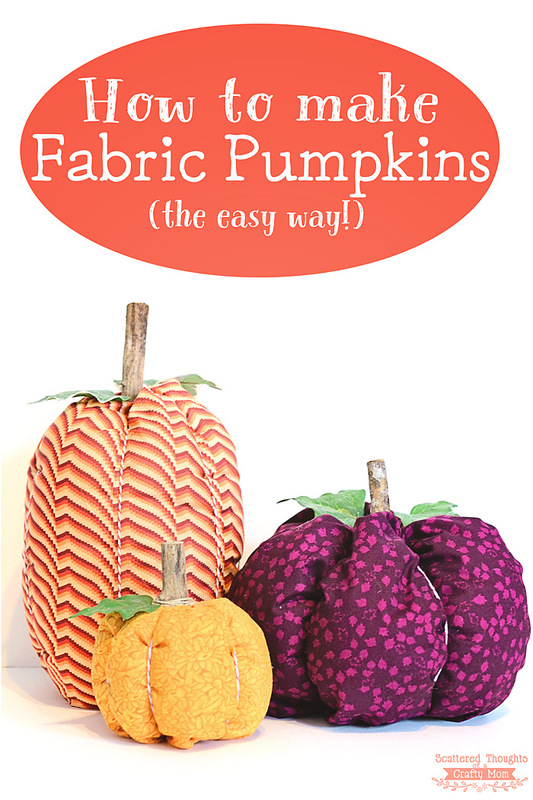 Make cute fabric pumpkins for your holiday table. This is a very easy sewing project that can be accomplished by hand or with a machine. Whichever method you choose, the project comes together quickly. You can make a variety of sizes and colors in different fabrics for a fun, relaxed look. These would make excellent gifts. This easy project is made with painted Mason jars and burlap ribbon. Paint the jars with chalk paint for a matte appearance. Add lettering to wide burlap ribbon. Tie a twine bow on the neck of the Mason jars. 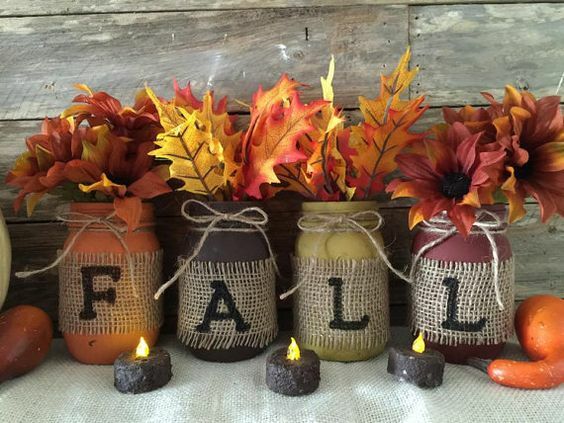 Add fall leaves and greenery to the jars. 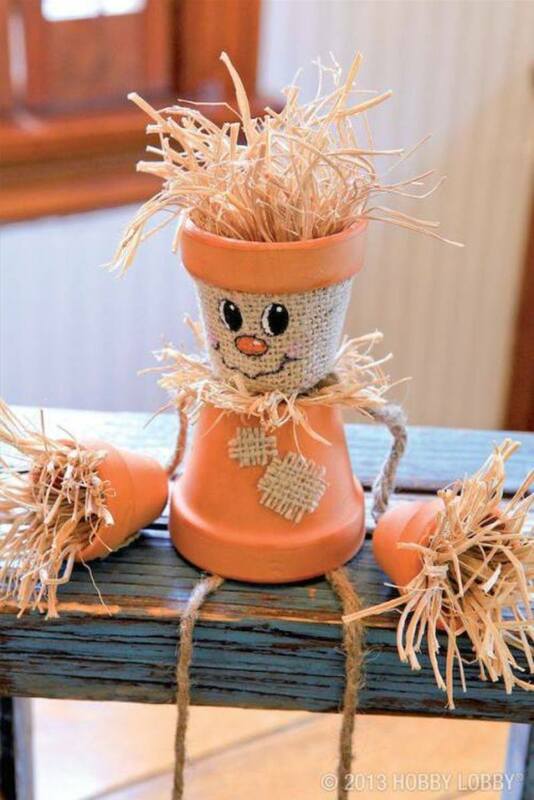 Make this funny little scarecrow craft with small terracotta pots. You don’t even have to paint the pots, just leave them terracotta orange. Add details with burlap, grass, and rope. These would look cute sitting on the windowsill or on the mantel. This would also be a great project to do with kids. Upcycling wine corks into this charming pumpkin is easy. 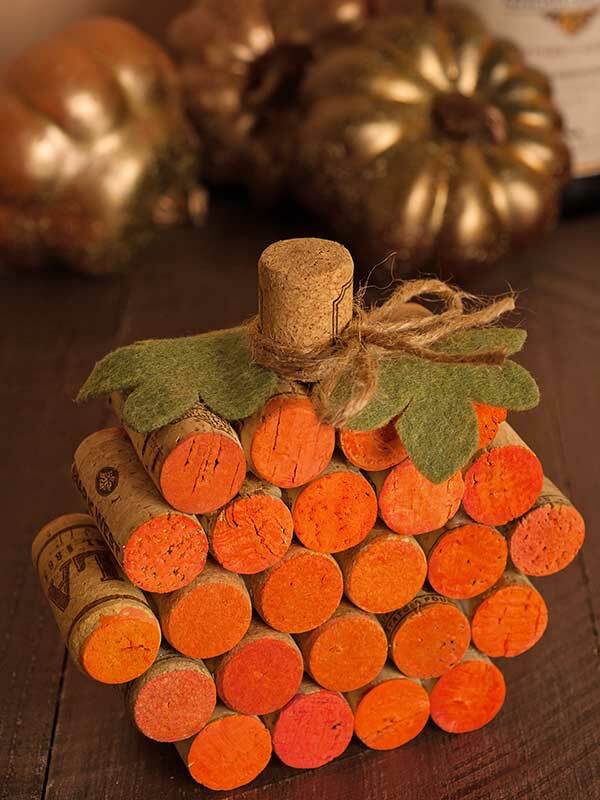 Just glue the corks together in a pumpkin shape using a hot glue gun. Add a stem to the top. Paint the ends of the corks orange. Add a few felt leaves and a twine bow. This is a great way to repurpose something that would ordinarily go in the trash. A charming porch display reminds visitors of the county fair. First find your planks and make them into a sign. 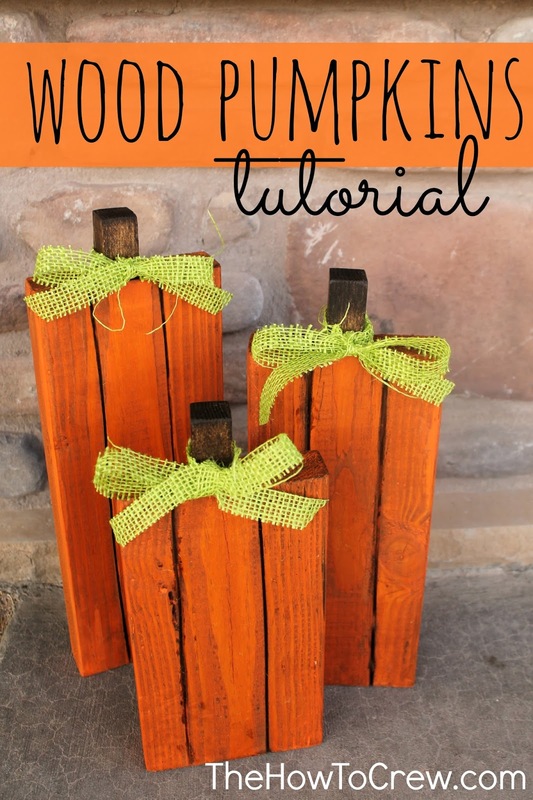 This is an easy project for any woodworker. Use a dark stain on the sign. 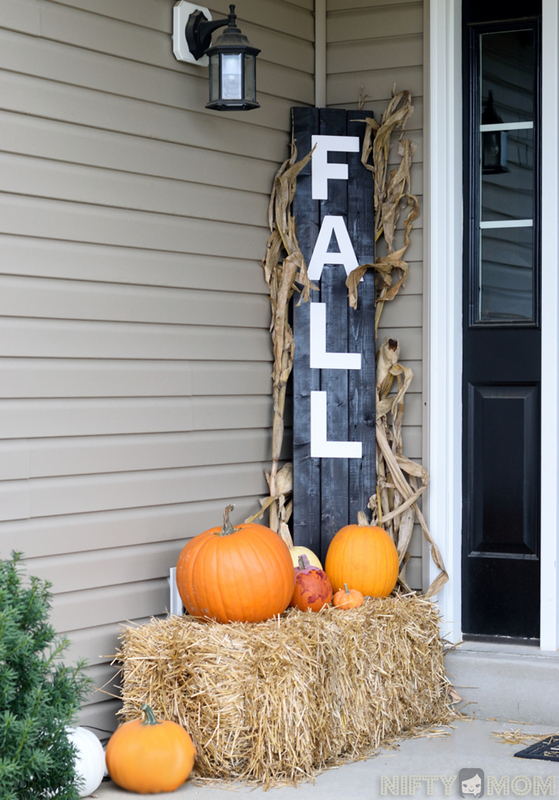 When it’s dry, add wood letters to spell “Fall.” Complete your display with a hay bale and some pumpkins. These cinnamon stick candles look beautiful and smell divine. 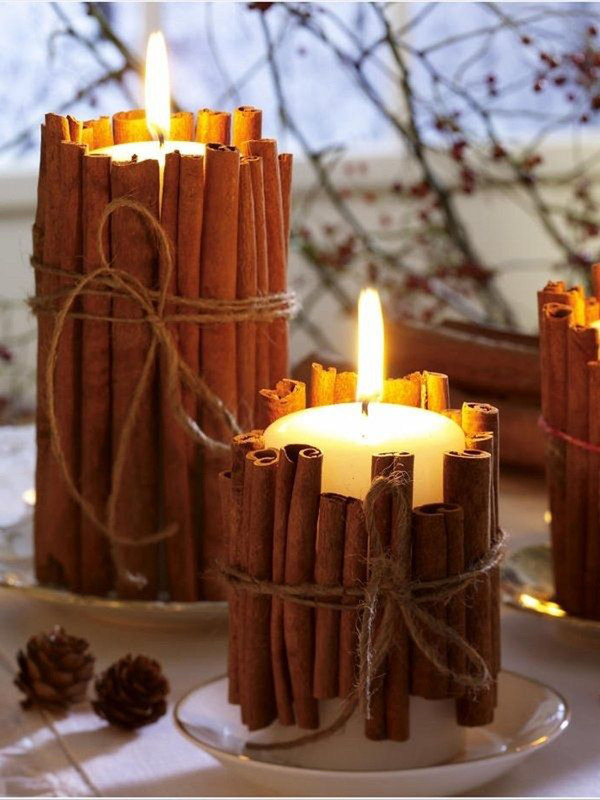 All you need to do is to tie cinnamon sticks of varying heights onto your candles using twine. Be careful with these and don’t let them burn unattended. You’ll love the way they fill your home with the sweet scent of cinnamon.